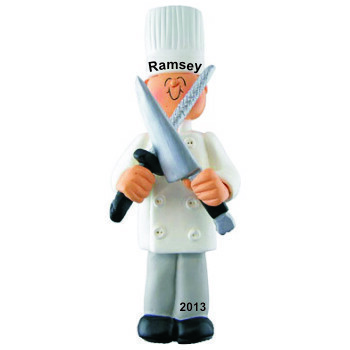 Looking ready to prepare something deliciously interesting, the chef male personalized Christmas ornament is a fun gift idea for your favorite pro. We hand letter the custom details you provide onto these chef ornaments personalized for the guys who work their magic in the kitchen. A gold cord is included for displaying the male chef Christmas ornament personalized just for him that arrives in our classic velvet gift and storage bag.